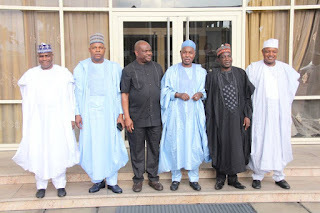 Northern Governors Visit was a Mockery to Benue People – Benue Elders Elders in Benue state have openly condemned the visit of the Northern governors to Benue state. The elders said the Northern governors forum who visited governor Ortom were in the state to mock Benue people. Peter Duru and Nwafor Sunday A group of prominent Benue indigenes, Benue Advancement Forum, BAF, has described the visit by members of the Northern Governors Forum to the State three weeks after the killing of 73 innocent people by suspected herdsmen in Logo and Guma Local Government Areas of the state, as belated, face-saving and mockery on the State. The organisation, led by its Chairman, Professor David Lornem, made its stand known yesterday, when it paid a solidarity visit to Governor Samuel Ortom, in Makurdi. Benue elders In an address presented by its Deputy Chairman and former Minister of State for Education, Professor Jerry Agada, BAF wondered why it took the northern governors a long time to pay a condolence visit on their colleague who lost many lives in one attack. “We therefore demand an apology from the governors because they only came to mock us over the unfortunate incident that befell us as a people. “BAF condemn the recent herdsmen attacks on children, women and defenceless other people in Guma and Logo and we fault the silence of President Muhammadu Buhari over the killings. We urge the Federal Government to arrest those behind the genocide and declare herdsmen as a terrorist organisation. “BAF will also want to state that we do not trust the intentions of the Federal Government in sending troops to Benue even as the Government of President Muhammadu Buhari has not come out clearly to support the anti-open grazing law in Benue. It seems that the government does not believe that Benue State House of Assembly has any right to make laws that are acceptable and beneficial to protect the interest of Benue citizens.” the group stated. They also urged Governor Ortom to remain courageous and firm as he had been on the Open Grazing Prohibition and Ranches Establishment Law which they described as the best solution to lasting peace in the country.